The Love Song Bar (next to The Regent on Main in downtown L.A) will host the Aryn K Pop-Up this Sunday from 2 – 6 p.m. The event—which celebrates the brands relaunch as an eCommerce site—will feature drinks, shopping, a photobooth, and the opportunity to mingle with fellow fashionistas. The L.A. based life inspired brand is dedicated to girls who embrace their own future and are creatively living out their dream. 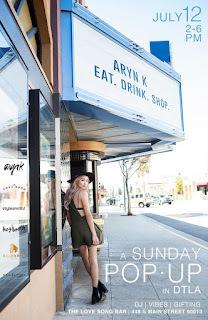 Aryn K clothing is designed with a “capsule collection” mentality; thus, allowing you the freedom to mix and match pieces that fit your personal style. The eCommerce site also offers a “shop your fit” styling tool, which suggests products that will compliment your unique body type.